Some Peek in the Stacks blog posts are authored by CSUN students who work in Special Collections and Archives in the Oviatt Library. This week's post was written by Raquel Dubin, a student assistant in the Urban Archives. Raquel is a sophomore. 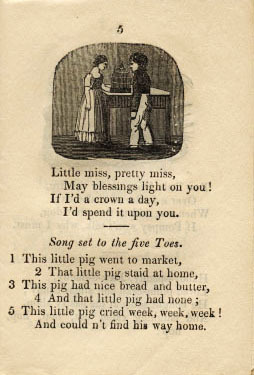 Chapbooks are small books that were sold on the street for a penny or less from the 17th century to the 19th century. 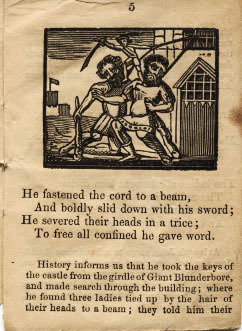 Publishers created the books with cheap materials and with woodcut illustrations that often didn't relate to the subject matter. People of the lower socioeconomic classes could afford to read literature printed in them. 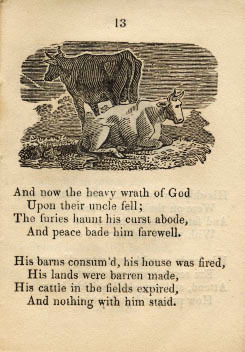 Chapbooks declined in popularity after the 1860s due to the rise in popularity of other cheap publications like magazines and newspapers. Due to the cheap quality of paper used to create them, preserved chapbooks have become rare. Special Collections and Archives holds a small collection of them, which includes nine preserved chapbooks produced in the 18th century. The books consist of literature created for children by J.G. Rusher. Notably, several of the chapbooks contain familiar stories. 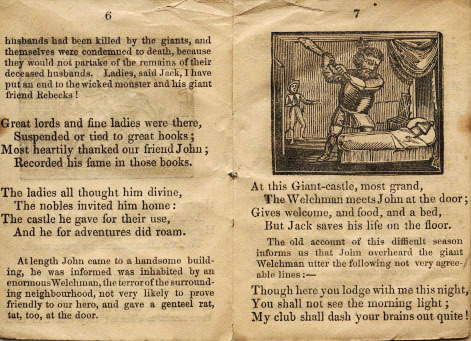 The story of "Jack the Giant Killer, a Hero", for example, contains a story analogous to the modern "Jack and the Beanstalk". 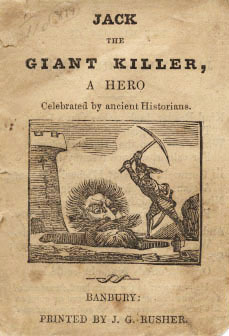 In the chapbook, written as though the events of the story truly occurred, Jack slays giants who had been terrorizing the population. He is celebrated for his bravery and becomes rich. 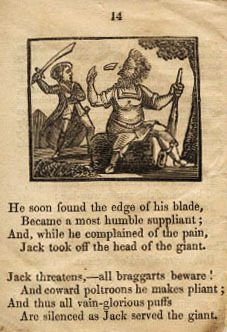 The modern tale, in comparison, is far tamer: Jack either prevents the giant from coming down or indirectly kills the giant by cutting down the beanstalk. He becomes rich after stealing (or rescuing) a goose that lays golden eggs. 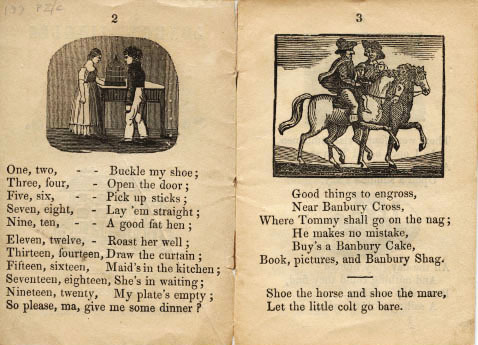 The differences in reading material reveal that modern children stories generally are less violent than they used to be. 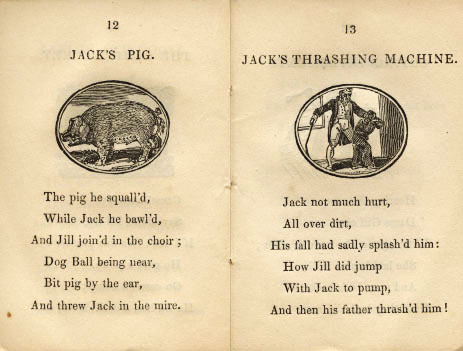 The chapbook "Jack & Jill, and Old Dame Gill" includes another familiar story in the form of a longer, earlier version of the nursery rhyme "Jack and Jill". 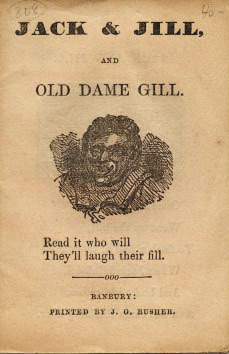 In the chapbook, Jack and Jill go home to "Dame Gill" (their mother) who bandages Jack's head since he "broke his crown". Jill laughs at her brother's bandaged head, and her mother whips her across her knee as punishment. The narrator describes each of the children's beatings in a lighthearted way intended to make the reader laugh though the beatings sound painful and are given by their parents. In the modern version of the nursery rhyme, Jack and Jill's mother thanks them for fetching a pail of water. 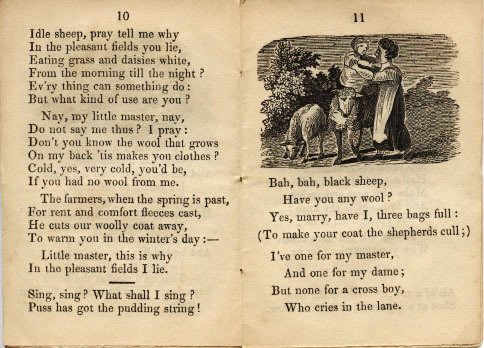 The juxtaposition of the nursery rhymes is an example of changing levels of acceptance across society for corporal punishment of children. The chapbook the "Book of Beasts" includes unfamiliar content. 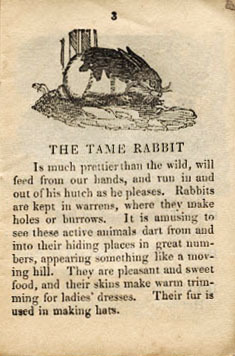 The book teaches children about animals with details that wouldn't commonly be used in modern children's literature. 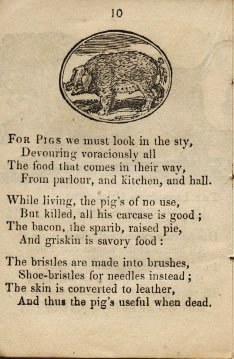 For example, pigs are described more as a food source than as intelligent animals. The "Interesting Story of the Children in the Wood" is another story which doesn't have a particular modern-day match. The story is about two children whose parents died, leaving them in their uncle's care. Their uncle plots to kill the children so that he can take the fortune that their parents left for them. The story includes strong messages of Puritan beliefs. Preserved chapbooks are rare today, and those that remain contain interesting details about the eras they were made in. In this case, they show what publishers printed for an audience of children.